Update (31 Jan.): this object received the official designation 2014L on CBET 3795, announcing its discovery. 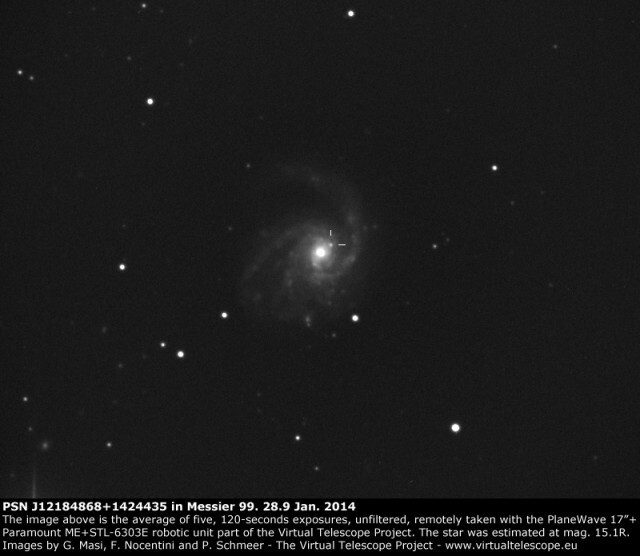 It also reported the confirming photometry and astrometry by the Virtual Telescope “Additional CCDmagnitudes for 2014L:[…] Jan. 28.968, 15.1 (G. Masi, F. Nocentini, and P. Schmeer; remotely using a 43-cm telescope near Ceccano, Italy; position end figures 48s.73, 44″.4)”. On 26.8 Jan. 2014, a supernova candidate was spotted in Messier 99, a nice spiral galaxy in Coma Berenices. The host galaxy is at at 60 millions of light years. The suspect was named PSN J12184868+1424435. At Virtual Telescope the PlaneWave 17″ robotic unit was asked to check for this PSN the first night after the news was made available. Several 120-seconds images were taken, unfiltered, and showed the suspect at mag. 15.1. An average of five of those images is shown above.